The Bangkok stop, could NokScoot still be interested in the A330neo or have they settled to go for more used 777s. And of course Thai Aiways could order some to add to their collection of models. You can only say a particular aircraft model is not a success when it becomes clear that Thai won't be ordering any. Hmmn...the proving flights will include MNL.....I wonder why? Bangkok and Hong Kong too, as a matter of fact. None of airlines based in Thailand or Hong Kong placed an order for A330neo. With the rumoured Vistara's 787 order, NokScoot will most probably ended up with new 787-8/9 if they are getting new toy, allowing cost saving and synergies between the many subsidiaries within SQ Group. Or it could be because of the massive Air Asia X order. Airbus needs to do route proving flights for AAX, so I'm not reading too much into the BKK/ MNL stops. To me, they just look like logical places that AAX would operate the neo to, at least initially. Are they? I thought they were second behind CX/KA? Do you have the comparative numbers? It depends how you count. If you count all versions including freighters, TK is the biggest operator with 62. If you count only pax frames, it is Air China with 59. Could it be SriLankan Airlines, they might be interested in the neo after their failed A350 adventure to replace their oldest A332s. And they still have some A350s on order that they can convert. UL is not in any financial position to lease or buy new aircraft. Their A333ceo is very new and they got badly burnt by A350 fiasco. Their A333ceo can do most, if not all their current long haul (whatever still remains). Don't need the range of A330neos. But UL's 332s are now pushing 18 years of age, average unlike the new A333. Something pending me thinks but not picking UL is the carrier referred to above. 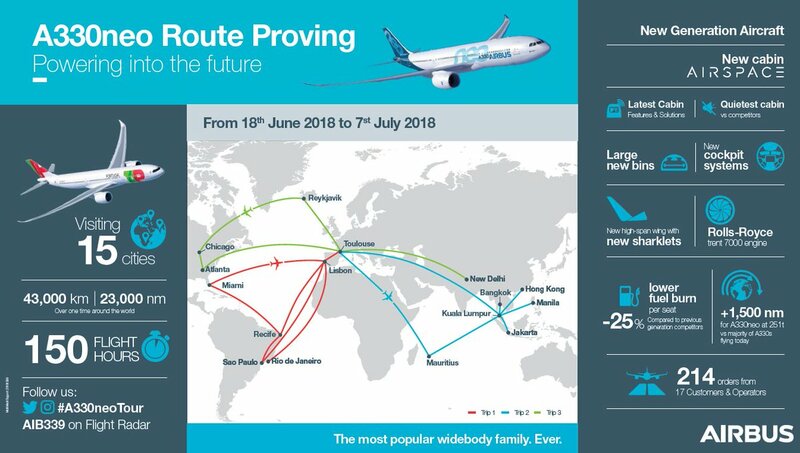 What you have said is true, however we are not sure if UL needs the A330neo's extra range since their furthest destination now is LHR which is easily reachable with their A330ceo. That list is slightly aged. But it hasn't changed too much since September 2017 when that list was made, no big movements in the top. Here's the top 25 taken from the most recent Airbus O&D spreadsheet. Only 3 of the airlines in this list have confirmed A330neo orders, most have 787 and/or A350 on order. Doesn't TK still have 4 active A343 too? This means more aircraft to replace. I believe an increased MTOW A338F would be perfect for TK. But that would be growth, replacement is decades away. TK has 25 A350 and 25 789 on order (per Wikipedia, something is nagging telling me the ratio shifted?). So while that is probably growth, with the new IST, I expect the replacement strategy to be more A321 or (judging by TK's large MAX orders) the MAX for half the A330s. The 787-10 and A359 for the other half. Sri Lamkan for 4 by conversion of A350 orders? Unless they take end-of-line ceos. Fokker 27, Bombardier Dash 8, Embraer 175 & 195, 727-200, 737-200 & -300 & -400 & -800, 747-400, 767-300, 767-400, DC 10-30, A320-200, A330-200, A330-300, A380. Airbus needs to do route proving flights for AAX, so I'm not reading too much into the BKK/ MNL stops. To me, they just look like logical places that AAX would operate the neo to, at least initially. It's true that PR has six options for A359s...but why use a hammer to crack a nut A338s are perfect replacements for their withdrawn A343s and could be had when leases for their A330s expire or as the latter come due for heavy checks. The big exception to this pickle is the major Chinese carriers. If I were Airbus sales trying to shore up A330neo production, I'd be on the phone with China Aviation Supplies every day. "'There were people in the industry who said the A330-800 wouldn’t be built, and then they said it would never fly. So today’s event proves that’s nonsense,' said Airbus’s A330 marketing chief Crawford Hamilton at the first flight event today in Toulouse. He says that as a derivative design, the development of the A330neo was relatively low-cost allowing Airbus some commercial 'wiggle room' when competing against the all-new 787. 'Lastly there are new markets like long haul low cost and nations that need a new entry-level aircraft.'" Brave fighting words. It seems like Airbus have gotten themselves a worthy successor to JL.....remains to be seen if marketing spin would translate to sales. Last edited by Devilfish on Wed Nov 07, 2018 5:39 pm, edited 1 time in total. Small is beautiful. Numbers 1 and 3 describe many airlines. They are not likely to place substantial orders but a trickle could add up to a respectable total over time. The challenge is that Airbus is competing for those orders against lessors, who have over-ordered the A330neo and are in a bit of a jam. Many small airlines (including those from emerging nations where financing a purchase may be a challenge) end up leasing their aircraft. I'm positive all of those lessor aircraft will get placed, but I think it's likely to be at the expense of further sales by Airbus. The quote you posted is intriguing and shows that Airbus still wants to make the same case for the A330neo that it was making before Boeing dropped 787-9 prices. We will see if Airbus really is able to undercut Boeing despite the lower production rate on the A330 line. The problem with small airlines is that they are usually picking up what is cheapest...which is typically determined by what the big boys are choosing. It is a hard market to rely on long term for a new aircraft. If big boys are not picking A330neos then lessors will stop buying them for speculative purposes (favoring the 787, A350, or whatever instead) and it will be the 787, A350, or whatever that is cheap to lease or finance and not the A330neo. This when it comes time to replace their fleet, or if a new airline is starting long haul ops, they are more likely to choose the 787, A350, or whatever over the A330neo, and it becomes a viscous cycle. Crawford Hamilton is not Airbus’s new sales chief btw. He has been with the company for almost 24 years and has been a part of marketing the A330/A340 family since 2007. Looks like Corsair International has ordered 3 a330 900 neos to replace their 747 fleet. I wonder if they are leased. It sounds like from the google translate they are unsure yet if they will lease the planes or buy direct. TK has more A330 and CX + KA have more passenger A330. Air China has 59 passenger A330. The biggest competitor to the A330neo is the A330ceo, lots and lots of frames in the market. A 10 to 12 year old coming off lease is far less to either lease or purchase. I'd keep an eye on the Thomas Cook Group. There was a thread on here quite recently that they are looking at long-haul aircraft to replace Condor's fleet of 767's, however other airlines within the Group (TC UK and Scandinavia) both use A330's and UK have been slowly expanding long-haul in recent years using second-hand aircraft and leasing from Air Tanker, particularly out of MAN to the US. They have also been shuffling aircraft across the Group, so there's an opportunity here to standardise on one widebody type for the entire group. The A330neo has to have a shout here given the ceo's already in use and A320/A321's elsewhere, so there's potential for a decent sized order at a good price if they decide to place one order for the whole Group, but stranger things have happened. Another potential order in the coming years could come from VS. They have 10 A330-300's, however the challenge is that VS already have a large fleet of 787-9's and have A350's on the way, so a move to a two-type fleet could be the smarter approach. VS could of course simply extend the leases given they're quite young and are well-suited for the US East Coast/Caribbean routes. I would second that, Thomas Cook is a strong probability, I have heard from my sources however there is an on going debate between Condor and the rest of the Groups Airlines over B787 Vs Airbus... Condor want the 787, the rest of the Group Airline's want A330 for A330/A321/A320 commonality. Condor will have x3 Air Transat A330-200's this Winter flying for them (on the UK Reg with UK pilots)... so the plot thickens. Yes, there are lots of youngish A330ceos flying due to Boeing's delays in bring the B787 into production. These aircraft were ordered in place of the B787, e.g. SQ's A333 fleet are starting to come off lease now. For sectors below 3,000 nm, the A330Ceo's operating costs are not that significantly lower than the A330Neo's. So these aircraft are still competitive. I would expect airlines to accelerate orders for the more fuel efficient A330Neo's should the price of oil rise. I don't have the numbers - but I think aircraft orders did spike when oil hit USD 150. With oil now around USD 70, airlines are still comfortable and are taking their time to replace the older, less fuel efficient planes in their fleets. To be honest every serious voice coming from Condor indicates used A330CEOs. AirAsia is currently in talk to convert some A339neo on order to A321neoLR. If all goes well, we will see reduction in their 100 frame order. I suppose there's nothing to stop Condor from acquiring used A330ceo's if several in decent condition become available and Thomas Cook Group acquiring neo's for the other airlines. Some of the UK fleet were first delivered in 1999 to Airtours. I don't know what the operating costs are for these particular planes and when their next major checks are due, but I suppose only the Group themselves will know whether it's worthwhile to retain, replace like-for-like with newer ceo's or get new (either neo or something else). Either way, with the winter lease from Air Transat, Condor will get experience of the A330 which may help with their decision, though I'm still convinced any fleet renewal decision will be taken at group level and given the moves towards closer integration/fleet shuffling in recent years, it makes sense to standardise on the one type. Given the increases in recent months/years, I expect some airlines to be taking a close look at the trends as that may influence whether to stick with their existing fleet or bring forward replacement plans. I guess it'll depend whether upfront capex, oil prices or overall operating costs are more important to individual airlines. Another unknown is the impact of economic downturns as the downturn immediately after 9/11 led to some airlines parking old aircraft within a matter of weeks/months that may have otherwise stayed in the fleet for a few more years (or at least until the global recession/sharp increase in oil prices later on that decade). The A330 flew for the last winter already. The question for Condor is a conflict between fuel burn reduction and capital costs but also between high fuel prices and reduced demand in that case. Meaning reduced fuel burn from a factory fresh plane becomes more advantageous with high fuel prices, yet high fuel prices usually go with an economic down turn, which means less demand for long haul holidays. The Airbus O&D spreadsheet still shows an order for 66 as at Sept 2018. So their top up order has not firmed up yet - perhaps their change of mind is the cause and more negotiations are needed to include an A321Neo LR order as well. New sales chief, new chance to negotiate. But it has to be said that everything about the AAX order which was trumpeted as "assuring the future of the 330neo" has since looked kinda - well - shaky. Maybe just bad optics and Tony is absolutely thirsting for them. They do but your examples were perhaps not suitable. KUL-AKL is 4700nm , can't be served by a321NLR with normal config let alone with the dense LCC config. KUL-KTM can be served by current A320/a321 . Airbus makes much airplay of the commonality between the A339 and A338. How applicable or difficult would it be to divert shared long-lead items and other parts meant for the former to the latter and convert some of their orders to the smaller variant? I assume not too many are on the assembly line yet. Of course, the number of potential A338 frames that may be ordered is small to begin with...but that is the pain lessors have to bear for too much speculation. How much Airbus shares that suffering is up to them. Well, as they were quick to point out, Airbus does not have to amortize huge development costs on their A330neo program. If big boys are not picking A330neos then lessors will stop buying them for speculative purposes (favoring the 787, A350, or whatever instead) and it will be the 787, A350, or whatever that is cheap to lease or finance and not the A330neo. I'm not financially literate so this confounds me. On the face of it, supply and demand would favor the least expensive option. If banking institutions shy away from the A338, perhaps Airbus has a financing scheme to facilitate transactions (granting there won't be too many of those)? They might be exposed in a lurch, but such is the nature of their business. Hah...I missed the A330 qualifier in the presser.....think he would be displeased that I inadvertently promoted him? The financing issue on planes without a large user base and demand is in the residual value. Without going into too much detail the return on investment on a lease is roughly calculated as follows. Return = Principal & Interest Payements + Residual Value of Equipment Leased - acquisition cost. Now in reality it’s a lot more complicated and you have to consider the time value of money among many other things. But if you think the underlying equipment will be worth less than your interest payments need to go up. Principal is basically fixed. The only other solution is to accept less return on your money. There are lots of ways to finance an airplane but none of them benefit from an aircraft that isn’t perceived to have a good resale value. That impacts any type of equipment specific financing. I could see cathay ordering the A330-900neo in the future. I mean, they didn't order any B787, which rule out B787-10 for now. They only have A350 and B777 on operations and on order. And they have 58 A330-300 between the mainline and dragon line. Unless they want to increase capacity by around 30-40 passengers and opted for A350-900 Regional like Singapore Airlines did. Cathay Dragon has some very old A330s but these are paid off - so operating costs (without the need to make finance repayments) will be low. However, they do need to be replaced at some stage, probably by transferring Cathay Pacific's A330s to them. That means Cathay Pacific itself will need to find replacements for the A330-300 and there are signs that the A350 is the aircraft that is doing it. So I think that an order for A330Neo from them may still be someway distant! Yeah, I wonder if Cathay would go for A350/B777 combo in the future. But it would signal capacity increase from A330-300 they used now. If they gonna use A350-900 Regional for A330-300 replacement, they would be able to fit around 339 economy seats and 24 Regional business seat. Which is around 46 more Y seat. For other A330-300 configurations, they would be able to carry the same number of C seats but with 267 economy class seats which is 44 more seats compared to the current configs on A330-300. The 3rd configs would gave them 40 extra economy class seats with the same number of Business class seats and premium economy seats. To be fair, around half of the A330-300 in Cathay's fleet are still pretty young. They also use the Trent 772B which is the good one which many airlines prefered. So maybe they are still interested in Keeping it alive for few decades to come. I am a bit surprised that Dragon has not (yet) tried 9 abreast on its A333s. The slight extra interior wdth on A339s my allow that. What extra interior width? To my knowledge the only things that are changing in the 339 cabin are the Space Flex arrangement and the design of the bins and ceiling panels. A 9Y 339 is still going to be a ULCC/charter proposition only. The only plane getting an interior width increase is the 777X. Hoping for these to be for Swiss... Longshot but one can hope.